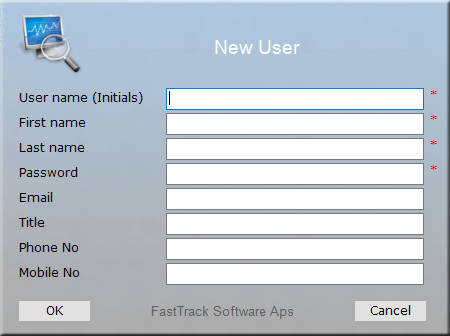 FastTrack Automation Studio comes with the ability to build an application to perform basic operations on your Active Directory by a Help Desk or similar without being domain administrators plus a few extras, such as the ability to restart the spooler service remotely on clients. The purpose of this is to both make sure the Help Desk cannot do more than needed, to avoid accidentally deleting or moving of objects, but also to avoid having them being domain administrators. Imagine someone accidentally deleting an OU with all users in it, or dragging an entire OU sub-structure somewhere else, resulting in new policies applying. The result nothing short of a disaster. The Home Screen can build the application for you, where you simply select which features you would like to make available. The great part about it is that it's basically just a pre-built FastTrack script, so if it does not suffice, you can simply tweak is however you need in Scripting Mode and modify to your needs and hit the save as exe button to built your customized version. Because this script/application uses all the most common Active Directory features of the core language, this page also serves as the general documentation page for Active Directory core scripting commands. When the application (script compiled into an exe file) is executed, the Help Desk user sees the menu below, which allows only the tasks the administrator has decided that he or she is allowed to perform. All that is required to produce the application below including all functionality and validation, is only 150 script lines including comments and readability spacing, and requires no embedding of graphics or third-party tools! 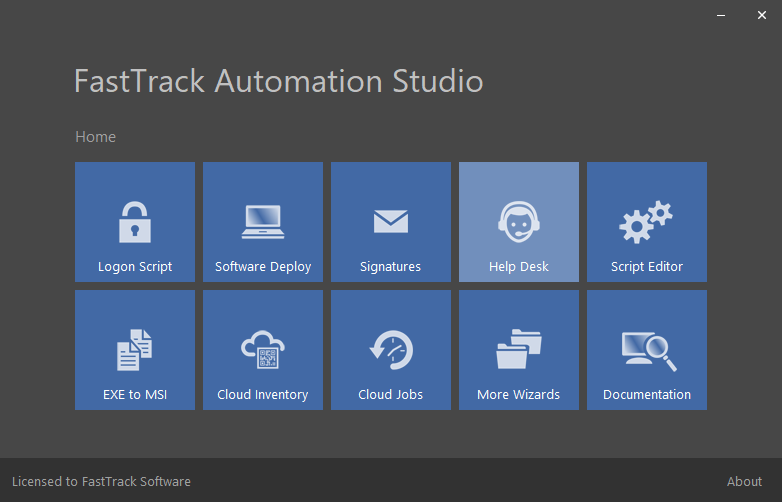 When you start FastTrack Automation Studio, you start in the Home Screen. Click the "Help Desk" icon and click "Help Desk App" in the submenu. 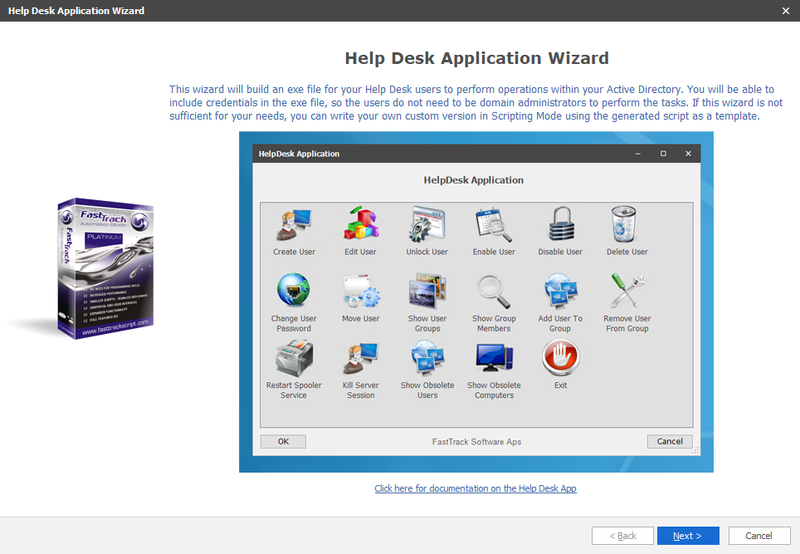 In the wizard, select the menu options you need and you have a Help Desk Application exe file ready to run. The above shows the page in the wizard, where you select features. A page will also show up allowing you to enter credentials for a domain administrator account to switch to upon execution of the exe file. Before you read on, you can click the play button below to watch Senior Technical Writer Steve Dodson from Binary Research International walk you through the script and show you how you can modify it for your own needs in the Script Editor. Note that the video was shot before it was possible to build the application from the Home Screen, but it shows the application in function. The rest of this page explains how to use the Active Directory features of the core language using this Help Desk application as a case. Most of the script behind the Help Desk application is querying the end-user for information, asking for verification and wrappers. The actual operations performed, are always only one script line. Let's look a the Help Desk application script as a case on how to modify Active Directory from scripts, which you can easily create you self in the Script Editor. When scripting the Active Directory with FastTrack, no knowledge of the inner workings of the Active Directory is required. Interfacing with the Active Directory requires all objects named by their full distinguished name, but FastTrack will resolve this for you; you can enter the full distinguished name of an object, but in general, just use the names shown in "Active Directory Users and Computers". The domain, the object location in the organizational unit tree and the actual distinguished name of the object will automatically be resolved at run-time for you. Below a list of the actual Active Directory commands and collections used in this example script to perform the Active Directory operations. 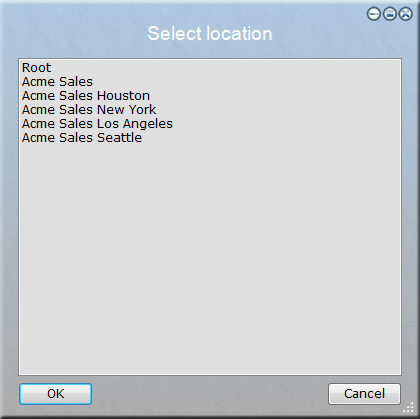 Collections are typically used for loops and list menus and in this example the collections are used to feed the ListMenu function with values, to a produce a selectable list. For readability, variables are in the two tables below are replaced by static values. 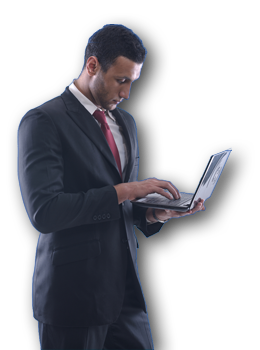 If you are fairly large organization with a development division, consider the option of building a company specific Help Desk application that lets FastTrack handle the complexities of your Active Directory. All your application has to do to execute the operations, is to build a script file in normal ASCII format and pass it to FSH.Exe. FastTrack is the only scripting language available that delivers a real graphical user interface to the scripter, without requiring any kind of graphics skills. This example script uses only built-in menus, icons and dialogs that are easy to use when writing scripts. 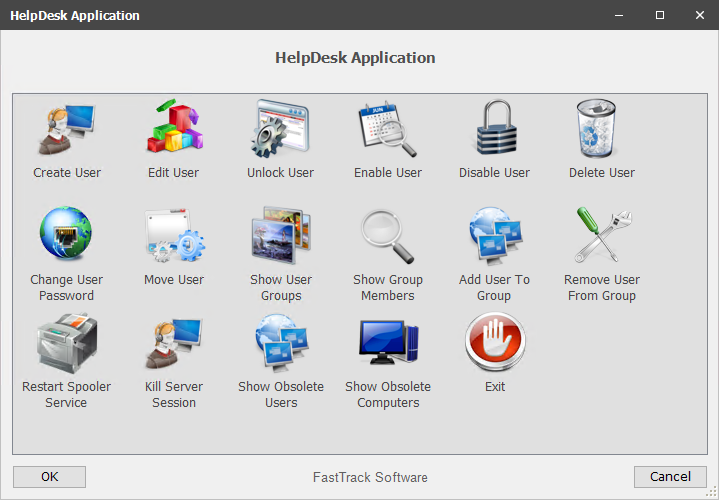 Every time the Help Desk user clicks a menu item, a new graphical user interface is shown with professional looking dialog boxes. When clicking "Create User" for instance, information about the new user must be entered. It requires just one simple script line with the MultiInput command to produce the screen below to the left, where all fields are returned as variables for the further processing. When the information is entered, a list of all organizational units are displayed to request organizational placement of the new user, as shown below to the right. This also requires just one script line, where the collection AllOUs is fed to the ListMenu function. In most cases, it is preferable not to have to execute the actual script as an administrator. To avoid this, you can simple insert a single line at the top to change the executing user of the script. The password for your domain admin user is irreversible and must be encoded inside the script editor. Licensed users can encrypt the whole script to also hide the domain admin user name. The script listed is available directly in the script editor. Go to the "Documentation" tab, select "Help Desk Example Application" under the "Insert Example Script" submenu and press F5 to execute it. ShowMessage "User [UserFullName [Var UserName]] is now created and ready to logon"
ShowMessage "User [Var SelectedUser] is now deleted and can no longer log on to the network"
ShowMessage "User [Var SelectedUser] is now disabled and can no longer log on"
ShowMessage "User [Var SelectedUser] is now enabled"
ShowMessage "User account [Var SelectedUser] is now unlocked"
ShowMessage "The user [Var SelectedUser] can now log on with the new password"
ShowMessage "User [Var SelectedUser] is now moved to location [Var SelectedOU]"
ShowMessage "You cannot add users to any administrator group!" ShowMessage "User [UserFullName [Var SelectedUser]] is now a member of the group [Var SelectedGroup]"
ShowMessage "You cannot remove users from any administrator group!" ShowMessage "User [UserFullName [Var SelectedUser]] is no longer member of the group [Var SelectedGroup]"